When most of us think about blade baits we think about deep water, and cold water. Recently, however, I fished one shallow in the Upper Chesapeake Bay, and with great success. I do have to admit, though, that the water was cold. We fished with a Molix Trago Vib Blade Bait for several different reasons. For one, it’s well balanced. It’ll hang in a horizontal attitude no matter how it’s fished. Another thing is that you can change its vibration. There are three holes on top. If you attach your line to the front hole you’ll get a light and close vibration. The back hole will give you a strong and wide vibration. And, when you want a good all-around vibration go with the one in the middle. That’s where I almost always start. It comes in two sizes — 3/8 and 1/2 ounce — and in a half-dozen colors. I like the choice of size and weight. That’s important, but what I really like are all the colors. It’s important to match the hatch with a blade bait. There’s never a time when I don’t pick a color that’ll come as close as possible to whatever they’re eating at the time I’m fishing. I want something that looks natural to them. What we did on the Upper Chesapeake Bay was pitch and flip into shallow water around whatever structure and cover we could find. The idea was to find something that would catch a bass that was holding in water anywhere between 2 and 5 feet deep. We were catching bass with other lures but we felt like the bite was tentative. The bass were just not as aggressive as we thought they ought to be given the conditions. We were sure we could do better with a Trago Vib. What we did might sound too shallow for most of you. I know that, and I respect it. 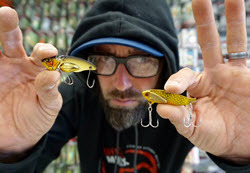 At the same time, though, I’m going to encourage you to give these baits a try any time the bass are holding shallow. They will produce. All you need is the confidence to fish one of them for a while. I can’t tell you much about how to fish them because it’s all about the conditions. Sometimes a fast snap up is the key. But at other times they want it slow and lazy. The same thing is true about the fall — let them drop or ease them down. The bass will tell you what’s right. As far as tackle is concerned my rod choice when I’m fishing a Molix Trago Vib Blade Bait is an Abu Garcia Ike Delay Series Casting Rod. I prefer the 7-foot model with a medium action. I use this rod for the same reasons I talked about last week. 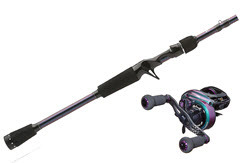 My Trago Vib reel is an Abu Garcia REVO Ike Casting Reel, 6.6:1 gear ratio. I spool it with 8 to 14-pound-test straight fluorocarbon. 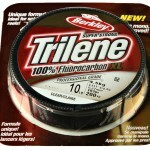 Of course, I always go with Berkley Trilene 100% Fluorocarbon. It’s the best I’ve ever used. Honestly, I don’t even think about using any other kind of fluorocarbon. Don’t limit your thinking this year. 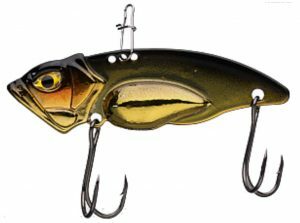 Fish all of your lures — all of them, not just blade baits — in a totally different way than what you have in the past. You’ll be surprised at the new opportunities that’ll open up for you.